Five UK providers of discretionary fund management (DFMs) have joined forces to launch a partnership to offer financial advisers an information platform relating to outsourcing investments, regulatory support and assistance in meeting ‘best practice’ requirements. Brewin Dolphin, Brooks Macdonald, Investec Wealth & Investment, Quilter Cheviot and Rathbones have launched The DFM Alliance, in a bid to offer IFAs support due to the rise in DFM services in recent years. The DFM Alliance, said in a joint statement announcing the partnership, earlier today, that it believes there is a need for greater clarity for advisers around “the concept of outsourcing” and what constitutes best practice. Mark Stevens, head of intermediary services at Investec Wealth & Investment said that the formation of the DFM Alliance will help address “the changing role of the adviser” in recent years. As well as outsourced investment management the partnership aims to provide a knowledge base for advisers to draw upon when undertaking DFM due diligence working and also debunk the myths around working with a DFM. Andrew Denham-Davis, director, business development at Brooks Macdonald said that that Alliance’s “combined experience and resources” will address the myths of the industry” and emphasise that “DFMs complement the adviser’s role”. The DFM Alliance aims both to remove any “perceived doubt or mistrust” that advisers may have that using a DFM may weaken their client relationships. “We are all different and it’s important IFAs have a choice,” said David Miller, investment director at Quilter Cheviot. James Goward, head of sales support at Rathbones said that DFMs are sometimes perceived as “expensive, less than transparent and even predatory”, but the Alliance aims to “educate advisers” about how outsourcing can add value. “Conversely, this remains a fluid space, and DFMs have just as much to learn about the changing needs of the advisory world,” he said. The DFM Alliance members, which have a combined discretionary assets under management total of more than £130bn, will host two free structured CPD conferences in June in Harrogate and Oxfordshire. 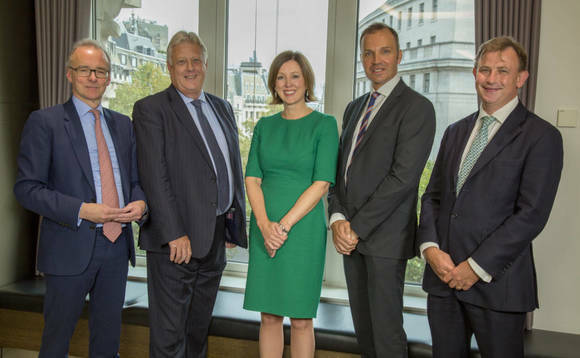 Pictured above left to right: David Miller (Quilter Cheviot), Mark Stevens (Investec W&I), Lucie Gordon (Brewin Dolphin), James Goward (Rathbones), Andrew Denham-Davis (Brooks Macdonald).